Scheme limited his production at the University of Alabama. He put together an underwhelming combine performance. He is a bit older (23) than his peers. Yet, he was one of the best wide receiver prospects in the 2018 NFL Draft and, now, the best rookie receiver in the NFL. Calvin Ridley, the Atlanta Falcons’ top pick in this year’s draft, buried any pre-draft red flags and served his doubters a plate of “I told you so” with his Week 3 performance against the New Orleans Saints. The 6-foot-1, 190-pound wideout caught all seven of his catchable targets for 146 yards and three touchdowns at Atlanta’s Mercedes-Benz Stadium on Sunday, earning the second-highest overall grade (86.0) among receivers in Week 3. He also drew a 45-yard pass interference penalty to help set up his third touchdown of the day and picked up nine yards on his only carry. Saints cornerback P.J. Williams played the villain in Ridley’s heroic efforts on Sunday, and as expected, the villain lost in the end. Ridley blew the doors off Williams on a double-move for his first touchdown, getting the four-year veteran cornerback to bite on his stutter steps early in the route before blazing past him for an easy six points. Ridley also torched Williams down the sideline for a 75-yard touchdown after beating his press coverage with a swift outside release. Ridley caught all four of his targets for 119 yards and two touchdowns when Williams was the primary coverage defender on Sunday. Ridley’s three additional receptions came against a combination of Marshon Lattimore, Marcus Williams and Vonn Bell, as he beat each of the three Saints defenders for one reception, all combining for three catches for 27 yards and a touchdown. Williams gave up the score when Ridley adjusted his route in a scramble drill early in the third quarter. Largely because of his performance against New Orleans, Ridley has earned the 21st-ranked overall grade (72.0) and 12th-ranked receiving grade (78.6) among qualifiers through Week 3. He also ranks eighth in yards per route run (2.41) and fifth in WR rating among wide receivers with at least 50 routes run this season. Ridley also leads all rookie wideouts in both overall grade and receiving grade, as he has even pushed ahead of the only wide receiver drafted ahead of him, D.J. Moore. The Carolina Panthers’ first-rounder has impressed in his own right, but his 70.2 overall grade and 73.2 receiving grade both fall second in line to Ridley. 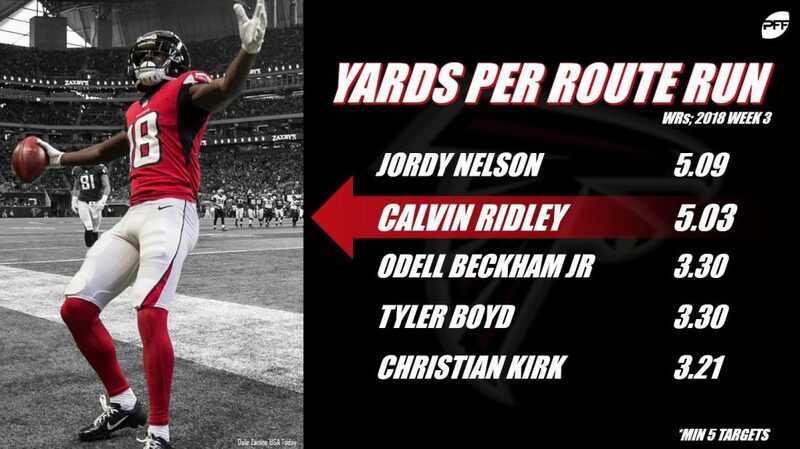 Unlike a majority of rookie wide receivers, Ridley’s hot start is the product of an expansive route tree; as he is proving early that he is no one-trick pony when it comes to running routes. The same can’t be said for Moore, as the former Maryland product has tallied his receptions on just two different routes this season and has seen targets on just three routes in total (screen, corner and an in route). Ridley’s next-level route-running ability dates back to his days in Tuscaloosa, as his short-area quickness and deceptive long speed gave him the edge on short and intermediate routes in addition to deeper ‘go’ and post routes. He caught at least one pass on 11 different routes with the Crimson Tide in 2017, and he recorded an above average passer rating when targeted on six of those 11 routes. Looking forward to the Falcons’ Week 4 affair with the visiting Cincinnati Bengals, Ridley will likely draw the attention of veteran Dre Kirkpatrick, who ranks 36th in overall grade (70.1) through Week 3. Ridley will have a larger target on his back after his coming out party on Sunday, but it will take Kirkpatrick’s best to keep the rookie from another star-level performance.